Now that they’ve resolved their long-running battle as to who ranks second behind Whistler-Blackcomb for highest vertical drop in the country (Kicking Horse won), Panorama and Kicking Horse have little to fight about. The distinct flavours of the two mean there’s little competitive crossover between the Hwy 95 resorts to spark any internecine strife. If your idea of an ideal holiday involves ski-in condo access, stocked kitchenettes, flick-on fireplaces, organized broomball games, enormous outdoor hot pools and the longest uninterrupted fall-line corduroy cruisers in the country, then Panorama is your place. Head west at Invermere—the town that Panorama Resort forgot—and climb for 18 km into the Purcell Mountains until you are funnelled into the central check-in centre (always open) where one of Panorama’s army of smiling 21-year-old staff members will greet you. Familiar small-talk is made easy since all staff have their hometowns proudly displayed on their name tags. By the time you mention that you passed through his or her town once 12 years ago, you’ll have your plastic swipe card key and a resort map in hand and be off to the parking garage beneath your condo unit. On the hill, adherents to the auto-vacation school of ski-tripping will be overjoyed to cruise Panorama’s famous groomers. But anyone getting the itch to break out of the mould should find an outlet in the steep tree runs of Taynton Bowl, a wonderful aberration of uncontrolled anarchy on the dark side of this total resort that was once only accessible to heli-skiers. Then again, if the thought of an après-ski sleigh ride sounds too tame for your tastes, you’ll want to head 120 km up the highway to Golden. This town set between the dusty highway and the still-clear Columbia River appears a tad tarnished following the clinical efficiency of Panorama’s building code, but don’t mistake rough-hewn for rundown. Golden is simply a real town. At one end of town you’ll find a CP rail yard, at the other end a lumber mill. At the midpoint between the two parking lots of pickup trucks there’s a small community of van-driving seasonal workers. They spend the off-season working in the oil fields and clearcuts of the west and return to Golden in the winter for its authentic atmosphere and its sprawling alpine terrain. 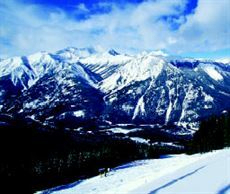 Forty-?ve per cent of Kicking Horse’s terrain is rated advanced, with 70 in-bound alpine chutes to pick your way down. It’s not all white-knuckle territory though. The bottom of the mountain is comprised of wide cruisers. And over the next three years part of a $15-million investment by the resort will go toward enhancing top-to-bottom cruising, making the legendary Kicking Horse terrain accessible to skiers of all abilities. With the recent addition of condo units at the hill, you can now choose all manner of accommodation for your stay, just don’t expect to find any tuque boutiques on the main street. You’ll have to settle for a camouflage hunting cap from the hardware store.